Written and recited by Cheryl Metrick with music composed and played by Frank Owens. These meditations are journeys of the mind. 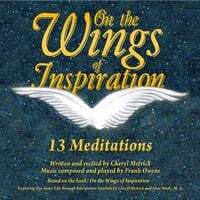 Single Song CD - Inspirational song about Angels ... watching over us... with a gorgeous arrangement by Frank Owens. Live string orchestra sounds intense and absolutely beautiful. The book is based on a collection of Cheryl Metrick’s drawings and poems. The premise of the book is to not only explore the interpretation of the art itself, but to journey into the drawings to find more personal meaning there. Both authors lead the readers to take their own inner journeys for self-awareness and inner growth. Cheryl writes her interpretations and feelings about each drawing in a narrative which Jeree then follows with a commentary and workbook section that delves into the symbolism to gently guide to readers through an analytical process in order to achieve greater awareness, become more mindful and to set guidelines in the continued pursuit of a purposeful and fulfilling life. Topics from the metaphysical philosophies to spirituality, humanitarianism, ecology, and energy systems are explored. The workbook sections include a wide range of themes: compassion, intention and focus, manifestation, balance, transformation, maturation, renewal, self-knowledge, self-sabotage, self-awareness, death, letting go, and the meaning of time. A guided process supports the reader to move into a place that is more peaceful and more centered to understand and implement life’s lessons.